I’ve stopped running for quite a while now. My right knee hurts when I run, and even after a prolonged period of no running, it still kind of hurts when I try and run. So I’ve sort of given up on running. Nowadays, if I do go out to the trail, I’ll do intervals of fast and slow walks (e.g., 3 minutes of brisk walk followed by 2 minutes of relaxed walk). And for the summer, I signed up for a spinning class. What is spinning? That’s just a picture I got off the web, and it’s not the gym at Lehigh. 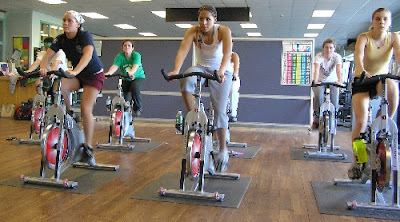 Today, I went for my very first spinning class. Totally clueless about how to set up the bike. After a short lesson from the instructor, I was ready. Turn up the resistance, run and place your hands at the top of the handlebar. OK, I got to sit and pedal, the “run” is too tiring. One more round, and we’re done with the warm-up. OK, now we’re going to some jumping. How on earth do you jump of a stationary bike?! Surprisingly, I slowly adapted and managed to last till the end of the 1 hour class. When I got off the bike, my thighs felt numb. And when I walked, I felt like my legs would give way and I would crumple to the ground. But I managed to walk to the car. I wasn’t even sure if I could step on the accelerator and brakes properly. And I drove, up the mountain, down the mountain, all the way home.